In 12-inch skillet, cook beef and diced onion over medium heat, stirring occasionally, until beef is thoroughly cooked; drain. Stir in remaining beef filling ingredients; cool slightly. Divide beef mixture in half; spoon into 2 (1-quart) freezer plastic bags. Flatten bags and freeze. At the campsite: Prepare rice and vermicelli mixes as directed on box, using butter and water and adding tomatoes (undrained), cumin and chili powder with contents of spice packets. Stir in cheese. Meanwhile, warm beef filling as desired. To serve: Fill tortillas with about 1/3 cup beef filling and about 1/2 cup rice mixture. Top with onion, cucumber and salsa. 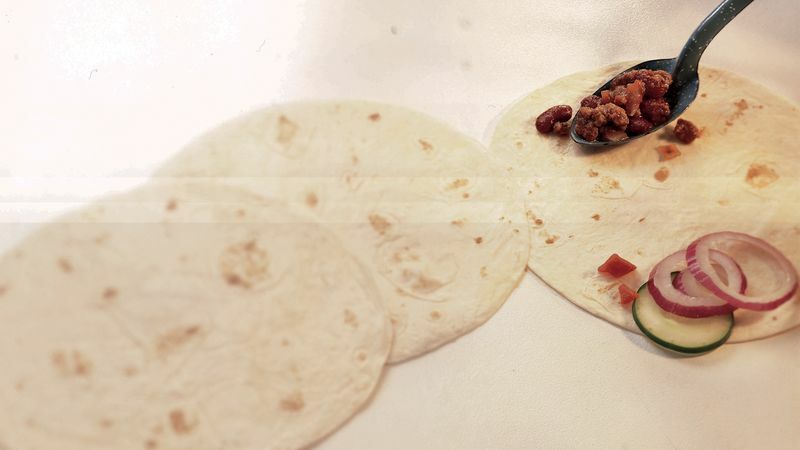 Roll up burrito style. Cook the beef filling ahead and freeze. Pack the frozen filling in a cooler to take to your cabin or campsite. To help conserve packing space, leave the rice boxes behind; bag the rice to pack along with the spice packets.